The Harvest Premium Greenhouse has great 8' of headroom - one of the highest in it's class. The sturdy powercoated GREEN aluminum frame will provides dependable service with 10mm twinwall polycarbonate covering that offers 100% UV protection. A true 4 season Greenhouse Kit. Easy to Assemble Innovative connectors that allow you to construct it yourself, this saves you time and money. Can be assembled by two or more people in 1 day. Included are step by step assembly instructions. Packaging The Harvest Premium Greenhouse construction means that all needed components for your Harvest greenhouse will be shipped in five easy to handle cartons via FED-EX Ground service! 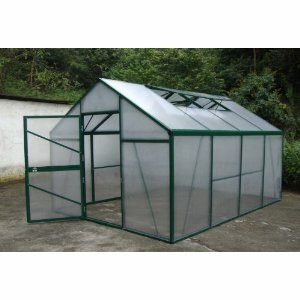 Compare this Greenhouse to the other models in this price and much higher price and you will truly see the value. 10MM walls and roof vs 4mm, 4 times thicker which makes this greenhouse stronger and better insulated. 4 roof vents vs 2 roof vents, 2 times more ventiation for better climate control. Almost 10' wide vs 8', 25% wider for allowing more plants. Over 13' long vs 12' long, about 10% more storage. 8' high vs 7', more room for larger plants and much greater head room.